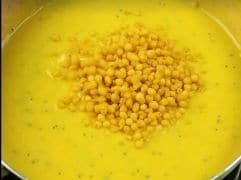 About Aamras Ki Kadhi Recipe: A quick, easy and tangy curry, Aamras ki Kadhi is a delicious blend of raw mango puree, buttermik and besan along with a host of other spices and chillies. 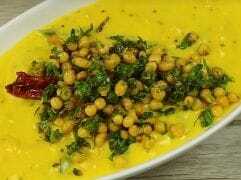 Finished with a generous amount of boondi sauteed with the kadhi and a spicy tempering all over. 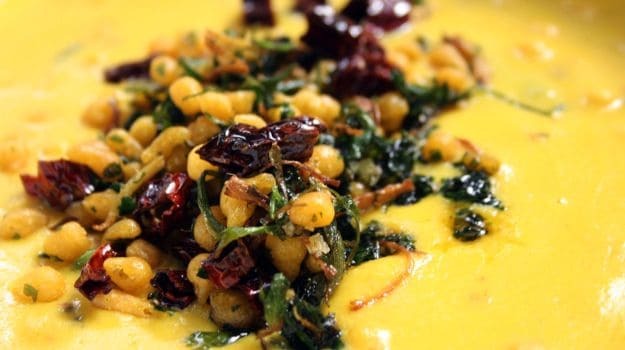 This is a great option to cook for a hearty Sunday lunch, served with hot chapatis or rice. 1.In a bowl, sieve besan and add the buttermilk. 2.Whisk well. 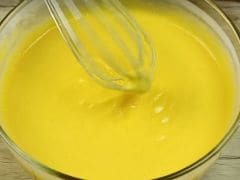 In another bowl, pour mango puree followed by raw mango puree and some buttermilk.Whisk together. 3.Add the besan and buttermilk paste to this, whisk a little. Then add turmeric powder, red chilly powder and hing to this. Mix well. 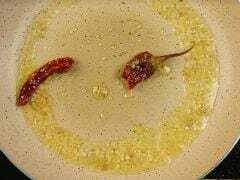 1.Add some oil in a kadhai. 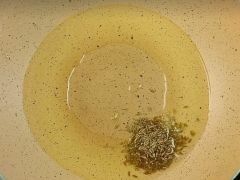 2.Add zeera to the oil and allow them to crackle. 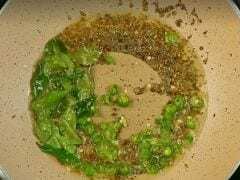 3.Now add the methi and mustard seeds. Saute a little and then add the curry leaves along with green chillies. Mix well. 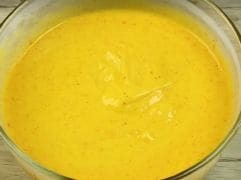 4.Now while keep stirring this tempering add the mango-besan mixture prepared before this to the kadhai. 5.Mix it well till simmer. Then add some more buttermilk and stir well. 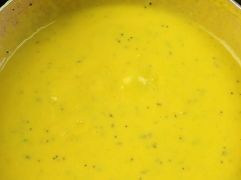 6.If the consistency seems to be too thick, you can add a little more of the buttermilk. 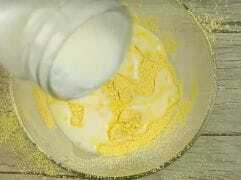 7.Now add a couple of tablespoons of the boondi and mix. 8.Let its simmer for about 6-8 minutes till the mixture thickens a bit. 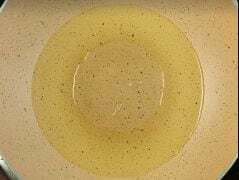 1.In a pan heat some oil (about a teaspoon). 2.Add whole red chilli and ginger to the pan. Saute well. 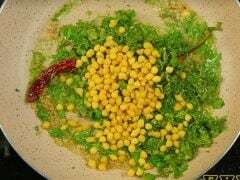 3.Add the coriander leaves and boondi to it and saute well. 4.Pour the tempering over the curry.